More info? Go to Legends of America or to Roadside America. In the early 1900’s, a ten year-old boy, impressed by a traveling missionary’s sermon about lepers, decided to raise money to help a boy suffering from the disease. 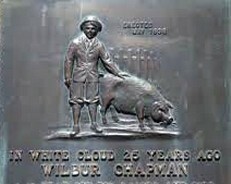 Raising a pig named Pete, Wilbur Chapman, sold the pig, donating the $25.00 from the sale to the boy with leprosy. His compassion caught the imagination of the public and started the "Pig Bank Movement” to help lepers and the name "piggy bank” was coined. A plaque commemorating the boy and the idea of the "piggy bank” is mounted on the Community Christian Church on Main Street.